Walter Cline Service Details - HAGERSTOWN, Maryland | Harman Funeral Home, P.A. — Harman Funeral Home, P.A. Walter Lee Cline, age 86, of Hagerstown, MD died Wednesday, July 24, 2018 at his home. Born October 4, 1931 in Downsville, MD. He was the son of late David Frederick and Beulah Catherine Bowers Cline. Walter retired from Mack Trucks. He's a member of St. Pauls Lutheran Church, Funkstown, MD and a US Air Force Veteran. 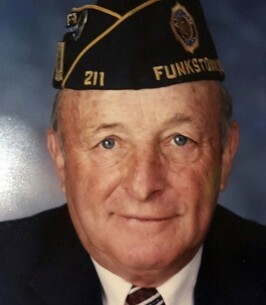 Walt was a 45 year life member of the Dixon-Troxell American Legion Post 211, Funkstown, MD, where he served on various offices and committee. He was elected three times as the Post Commander from 1984-1985, 2000-2001 and 1992-1993. He worked on the grounds committee at the Post for over 30 years. He was also active with the Legion Baseball program and the grounds at the Funkstown Baseball field. He was an avid Yankees fan. Walter is survived by his wife of 61 years, Betty L. Allen Cline. Six children Terri and Gary Gable, Kim and Mike Cordell, Patti and Junior Mills, Jeff and Annissa Cline, Douglas Cline and Betty Marshall, and Tracy Cline. Five grandchildren and eight great grandchildren. He is also survived by sisters Dorothy M. Shinham of Sharpsburg, MD, Shelby J. Stehl of Hagerstown, MD, Valerie L. Malott of Williamsport, MD, also numerous nieces and nephews. He was preceded in death by brothers Edgar M. Cline, Omer C. Cline, Ellis T. Cline, David F. Cline, Thurman P. Cline, Ross Cline, Lloyd M. Cline and sisters Doris F. Cline, Connie L. Martin, Mary Betty Kitchen and Waunita Martin. Relatives and friends may call on Sunday, July 29, 2018 from 6:00 pm to 8:00 pm, at Harman Funeral Home, 305 N. Potomac Street, Hagerstown, MD 21740. Funeral services will be held Monday, July 30, 2018 at 11:00 am at the St. Pauls Lutheran Church Fellowship Hall, 24 E. Baltimore Street, Funkstown, MD with Military Honors conducted by the Joint Veterans Council Honor Guard. Memorial contributions may be made to the Hospice of Washington County, 747 Northern Ave., Hagerstown, MD 21742. To send flowers to the family of Walter Lee Cline, please visit our Heartfelt Sympathies Store. We were so very sorry to hear of the passing of your Dad. May you and your family except our heartfelt Sympathy. God Bless. Farewell to my uncle and fellow Yankee fan. You will always have a special place in my heart. Now you are whole again and enjoying a great reunion with those in the family who have gone before you. Rest in peace dear brother. You are no longer in pain and no more suffering. My sincere sympathy to Betty Lou and the family. I will miss the times we shared, whether at the Legion or at our Cline family gatherings. Walter L. Cline, a former Chapter member, was a true hero of America's forgotten victory- the Korean War. Though no longer a Chapter member, nevertheless we condole with you on your loss. It was always a pleasure to see Walt at the legion. We offer our deepest condolences and prayers to the family. He will be surly missed by all.